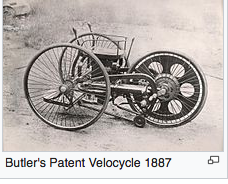 Imagine you lived in the Triangle in the 1880s and invented a petrol vehicle. Benz and Daimler and others abroad were having a go too, but you were first in this country. And your employers, Merryweathers, the fire engine manufacturers in Greenwich High Road, built your three-wheeler (pictured). And then, instead of developing and manufacturing it, they said, 'Forget it, it'll never catch on', or words to that effect. Everyone else agreed, 'It frightens the horses and it goes too fast'. That's what happened to Edward Butler of 31 Ashburnham Place. He stuck to boats after that. Quite a lot else has happened in the last 170 years or so since these Triangle streets were built - events as disparate as WW2 bombing, and Bowie developing Ziggy Stardust in what is now Gee-Pharm's basement. What's new is that we'll soon be able to check all this out for ourselves via a new archive to go up on the ATA website. The historical information comes from the research notes of local historian Richard Cheffins, late of Ashburnham Place. When this Knight of the Order of St John of Malta died recently, his card index boxes were rescued from the house clearers by Tara Veitch of Ashburnham Place and Mick Delap of Egerton Drive. Mick and digital ace Tom Webb of Ashburnham Grove are turning these notes into an easily searchable, cross-checkable, digital archive, eventually to be a multimedia mix of information and storytelling. It will give us all a new way to explore the Triangle's past. Mick will introduce the archive and some of its contents on June 10th in the Ashburnham Arms. Professional tour guide Neil Sinclair of Ashburnham Place will then take us round some of the Triangle's historical spots if we want to go, and we can all come back to the Ash for a drink and a chat and some of new chef Latina's excellent food.